The Teeling Whiskey Company has released two new bottlings from its Vintage Reserve Collection – a 26 Year Old Gold Reserve and 30 Year Old Platinum Reserve Irish single malt. The 30 Year Old release is believed to be the oldest bottling of Irish Single Malt recently released, allegedly making this the world’s most exclusive Irish whiskey. 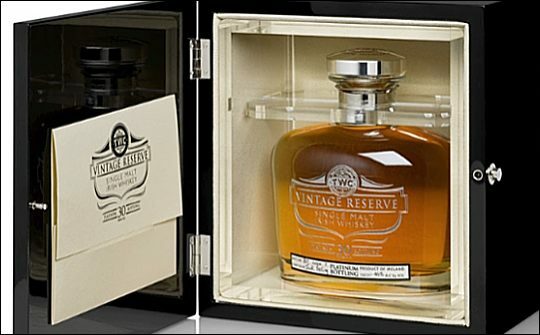 The Gold Reserve bottling consists of 26 year old single malt Irish whiskey doubled distilled in 1987 and matured firstly in bourbon casks then allowed to marry in white Burgundy wine casks. This small batch bottling of 1,000 bottles, is the first Irish whiskey to be finished in white Burgundy wine casks. The Platinum Reserve 30 Year Old bottling has been limited to 250 bottles. Having been double distilled in 1983 and allowed to rest for over 30 years in a Bourbon cask this limited edition whiskey has inherited a huge amount of character and is exceptional not only in taste but also in its rarity.